Some time back I wrote a feature for the Natural History Museum on the 'Prehistoric Times' (click here to read that), which is basically a tabloid-styled book that features facts, stories, and games about all things prehistoric. 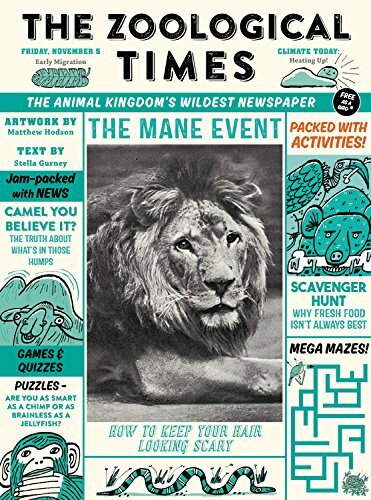 Now they're back, back from the jungle, but this time the NHM are attaching their name to something a lot more modern, The Zoo, or to be more specific about it, 'The Zoological Times', which is a 32-page softback compiled by Stella Gurney and Matthew Hodson. Fortunately, Stella had a bit of free time to tell us about her involvement with this book. So, Stella, it's now over to you! 1) Please tell us a little bit about yourself, Stella Gurney. In short, I'm a really wonderful person [Editors Note: Agreed]. 2) What inspired you to create, ‘The Zoological Times’? This book was totally a team effort with a lot of help from the great publishers at Frances Lincoln Children's Book. They would pay nightly visits to the Natural History Museum Archives Department when all the crowds have gone home, and rifle over interesting pictures to find, which is how they found all those amazing old photos and illustrations of dinosaurs and animals for this series. Those pictures were just begging to be turned into a newspaper format. 3) After writing this book, what do you find is the most surprising fact featured in it? There are a lot of facts in this book, but I love the fact that so-called cuddly hippos sweat this red, oily substance from their skin which looks like blood. 4) What song would you say best represents this piece and why? Hmmm, there are so many, but I think 'It's a Wonderful World' by Louis Armstrong probably sums up how you'll feel when you read about all these amazing creatures. Well, it's either that or Gangnam Style. 5) If you could get a celebrity – either living or dead – to promote your wares, who would you choose, and why would you want to choose this particular person? Derren Brown, because I've heard he's very persuasive. 6) During your time in this field, what is the one thing that has kept you in good stead? That would have to be listening to people so you can work out what they want. 7) If you had a personal motto, what would it be? Keep going; just put one foot in front of the other, as you really will get there. And on that note, I'd like to thank Stella for telling us about 'The Zoological Times', before encouraging you to pick up a copy via Amazon.